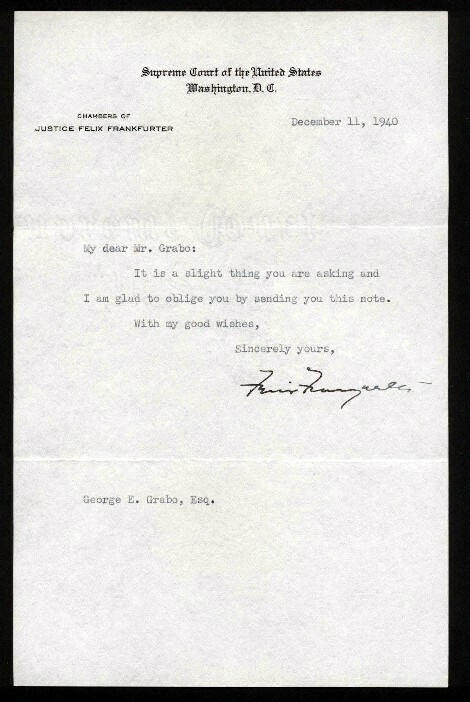 This is a clean letter in excellent condition with a strong signature from Frankfurter on his Supreme Court Chambers stationary shows how polite and accommodating he could be in an apparent response to an autograph request. Conscientious scruples have not, in the course of the long struggle for religious toleration, relieved the individual from obedience to a general law not aimed at the promotion or restriction of religious beliefs. The mere possession of religious convictions which contradict the relevant concerns of a political society does not relieve the citizen from the discharge of political responsibilities. The necessity for this adjustment has again and again been recognized. In a number of situations the exertion of political authority has been sustained, while basic considerations of religious freedom have been left inviolate. In support of his opinion the patriot Frankfurter expressed sentiments that now seem foreign to our legal jurisprudence and political discourse which is profoundly influenced by multi-culturalism:. Frankfurter was a noted civil libertarian so his balancing of interests in favor of the state caused quite a ruckus in 1940 the year he wrote our letter in what for America was still a pre-war year. Justice Harlan Stone wrote a strong dissent which became a primary basis of the reversal of this decision three years later in West Virginia State Board of Education v. Barnette in the midst of World War II.